Hatching and cross hatching are linear drawing techniques that can be used to create texture, value, and the illusion of form and light. Typically used as an application technique when the medium is linear in nature, hatching and cross hatching are often used together. Both techniques work well with a variety of different drawing mediums including pen and ink, graphite, colored pencils, and pastels. Hatching and cross hatching can also be found in traditional printmaking techniques such as etching and engraving. Some artists prefer to use either hatching or cross hatching in a specific drawing in order to create harmony. Most often however, the two techniques are used together in the same drawing or painting. While using hatching or crosshatching in a drawing can create a variety of textures, the technique is mostly used to create a full range of value. The placement of values within the work leads to the illusion of the form of the subject as well as the illusion of a defined light source. Hatching is created when non-crossing lines are used to indicate the value on or around an object. The value added to the object is dependent on the location of a light source. More marks are added in the areas of core shadow and cast shadow, while less marks should exist in lighter areas. When hatching is used, the lines drawn generally go in the same direction and are mostly parallel with each other. Sometimes, the lines may curve slightly or even a great bit depending on the contours of the object. Lines of this nature are referred to as cross contour lines. When used correctly, cross contour lines can further the illusion of form by giving the viewer information about the actual 3-dimensional qualities of the object. 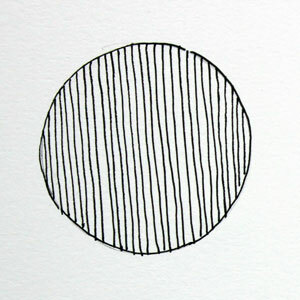 By changing the frequency of the use of line, and the amount of space between the lines, the artist can create a full range of value in the drawing. Assuming that an artist is working on white paper, more space between the lines (more paper showing) will lead to lighter values in the drawing. Less space between lines will naturally lead to darker values in the drawing. When cross hatching is used, the artist may begin adding value as hatching, but then allow the lines to cross over each other. The more that the lines cross over each other, the darker the value becomes. Many artists approach the addition of crossing lines as a science, following a specific order of vertical lines, followed by horizontal lines, followed by diagonal lines, and so on. This method produces very deliberate and controlled marks that are very exact and precise. Others simply cross the lines at random leading to “looser” drawings. Neither way is better, per se. Some looser approaches work better for some subjects, while more rigid approaches are suitable for other subjects. How hatching and cross hatching is used in a drawing is limitless. The artist can choose to make marks in any manner that they choose. They may also combine linear techniques to create a variety of textures or patterns. The arrangement of patterns can add interest to a drawing as well as push the tonal qualities. 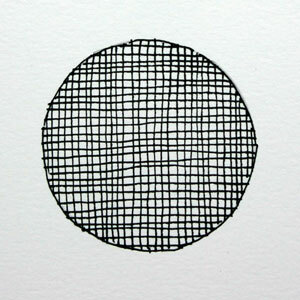 As mentioned before, hatching and cross hatching can be used for applying a variety of media. It is not just limited to pen and ink drawing. When the technique is used with a graphite pencil, the pressure becomes a factor in the development of values. The width and texture of the line can easily be manipulated. As with any drawing or painting, the cross contour lines of the subject must be considered. The marks that are applied must imply the form of the subject, which means that they should indicate or suggest the cross contours of the form. In order to suggest the invisible cross contours, we'll need to apply the hatching and cross hatching in a manner that follows the form. This will be a series of marks that "flow" around the form. The next set of lines should continue the development of the cross contours. This development continues with each set of subsequent lines that are added. The direction, frequency, and width of the lines are at the descretion of the artist. Ultimately, the marks should further the illusion of form. Failure to communicate the cross contours of the subject will lead to a flat drawing. If you are looking to challenge yourself with line drawing, choose subjects that are organic in nature. Geometric objects are easier to tackle with hatching and cross hatching, but organic forms require additonal skill.